Is it possible to love a torturer—even, or especially, if he is your most intimate relation? It was just a three-sentence letter, written 100 years ago—and many claim it’s still shaping the Middle East. But we should be careful about what we read into the Balfour Declaration. It is sheer sentimentality to ask photographs to do the work of politics and to make the choices that we cannot. Is a Left Zionism Possible? 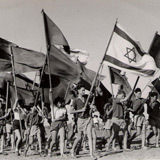 The spirit of left Zionism, which was strong enough to build a country, has receded to the margins of Israeli politics. Can it be revived? With a counter-argument by Joshua Leifer. Letter from Berlin: Utopia or Auschwitz? The German new Left was too close to the history it so desperately wanted to negate; it could not develop a sane or truthful relationship to the crimes and the cruelty of the Nazi era. Haunted by visions of the gas chambers, it believed that the only alternatives were the creation of a utopia or the recreation of Auschwitz. Given the level of alarmed debate and self-criticism in at least some major sectors of the Israeli press, the tsunami of vitriol that has descended on Peter Beinart and his book is fascinating, puzzling, and profoundly depressing. Books discussed: When a Crocodile Eats the Sun: A Memoir of Africa by Peter Godwin; Mukiwa: A White Boy in Africa by Peter Godwin; Don’t Let’s Go to the Dogs Tonight: An African Childhood by Alexandra Fuller; African Laughter: Four Visits to Zimbabwe by Doris Lessing; The Stone Virgins by Yvonne Vera.